Clusters of purple red flowers are striking against the bright green foliage of the upright mounding Agastache Summer Love. This fast growing hyssop perennial looks more like a summer liatris than agastache. The Summer Love long bloom time is from June through September. This medium growing perennial plant grows up to 24 inches wide and 24 inches tall. 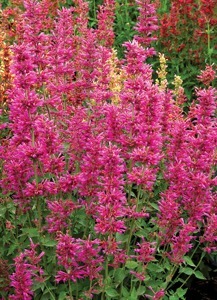 The Summer Love Agastache is a hummingbird mint that attracts both butterflies and hummingbirds all summer long. This strong grower is good for well drained to dry soil. An excellent prairie garden choice, butterfly garden, deer resistant plant. Pair this brilliant red purple flowering agastache with other perennials such as Moonshine Yarrow, Shasta Daisy, and Dwarf Joe Pye Weed.